The clinical definition of cardiogenic shock is decreased cardiac output and evidence of tissue hypoxia in the presence of adequate intravascular volume. Cardiogenic shock is the leading cause of death in acute myocardial infarction (MI), with mortality rates as high as 70-90% in the absence of aggressive, highly experienced technical care. See the image below. Patient with an acute anterolateral myocardial infarction who developed cardiogenic shock. Coronary angiography images showed severe stenosis of the left anterior descending coronary artery, which was dilated by percutaneous transluminal coronary angioplasty. Cardiogenic shock characterized by primary myocardial dysfunction renders the heart to be unable to maintain adequate cardiac output. These patients demonstrate clinical signs of low cardiac output, with adequate intravascular volume. The patients have cool and clammy extremities, poor capillary refill, tachycardia, narrow pulse pressure, and low urine output. Hypovolemic shock results from loss of blood volume, the possible reasons for which include gastrointestinal bleeding, extravasation of plasma, major surgery, trauma, and severe burns. Obstructive shock results from impedance of circulation by an intrinsic or extrinsic obstruction. Pulmonary embolism, dissecting aneurysm, and pericardial tamponade all result in obstructive shock. Distributive shock is caused by conditions producing direct arteriovenous shunting and is characterized by decreased SVR or increased venous capacitance because of the vasomotor dysfunction. These patients have high cardiac output, hypotension, high pulse pressure, low diastolic pressure, and warm extremities with good capillary refill. Such findings upon physical examination strongly suggest a working diagnosis of septic shock. Patients should receive instruction regarding the early warning signs of acute MI and how to access the emergency medical system (eg, calling 911). Patients must also be instructed on cardiac risk factors, particularly those that are reversible and subject to change (eg, smoking, diet, exercise). For patient education information, see the First Aid and Injuries Center and the Healthy Living Center, as well as Shock and Cardiopulmonary Resuscitation (CPR). Cardiogenic shock is recognized as a low-cardiac-output state secondary to extensive left ventricular (LV) infarction, development of a mechanical defect (eg, ventricular septal defect or papillary muscle rupture), or right ventricular (RV) infarction. Autopsy studies show that cardiogenic shock is generally associated with the loss of more than 40% of the LV myocardial muscle. The pathophysiology of cardiogenic shock in the setting of coronary artery disease, is described below. Cardiogenic shock is characterized by systolic and diastolic dysfunction leading to end organ hypoperfusion. The interruption of blood flow in an epicardial coronary artery causes the zone of myocardium supplied by that vessel to lose the ability to shorten and perform contractile work. If a sufficient area of myocardium undergoes ischemic injury, LV pump function become depressed and systemic hypotension develops. Patients suffering from cardiogenic shock often have multivessel coronary artery disease with limited coronary blood flow reserve. Ischemia remote from the infarcted zone is an important contributor to shock. Myocardial diastolic function is also impaired, because ischemia decreases myocardial compliance and impairs filling, thereby increasing LV filling pressure and leading to pulmonary edema and hypoxemia. Tissue hypoperfusion, with consequent cellular hypoxia, causes anaerobic glycolysis, the accumulation of lactic acid, and intracellular acidosis. Also, myocyte membrane transport pumps fail, which decreases transmembrane potential and causes intracellular accumulation of sodium and calcium, resulting in myocyte swelling. If ischemia is severe and prolonged, myocardial cellular injury becomes irreversible and leads to myonecrosis, which includes mitochondrial swelling, the accumulation of denatured proteins and chromatin, and lysosomal breakdown. These events induce fracture of the mitochondria, nuclear envelopes, and plasma membranes. Additionally, apoptosis (programmed cell death) may occur in peri-infarcted areas and may contribute to myocyte loss. Activation of inflammatory cascades, oxidative stress, and stretching of the myocytes produces mediators that overpower inhibitors of apoptosis, thus activating the apoptosis. Large areas of myocardium that are dysfunctional but still viable can contribute to the development of cardiogenic shock in patients with MI. This potentially reversible dysfunction is often described as myocardial stunning or as hibernating myocardium. Although hibernation is considered a different physiologic process than myocardial stunning, the conditions are difficult to distinguish in the clinical setting and they often coexist. Myocardial stunning represents postischemic dysfunction that persists despite restoration of normal blood flow. By definition, myocardial dysfunction from stunning eventually resolves completely. The mechanism of myocardial stunning involves a combination of oxidative stress, abnormalities of calcium homeostasis, and circulating myocardial depressant substances. Hibernating myocardium is a state of persistently impaired myocardial function at rest, which occurs because of the severely reduced coronary blood flow. Hibernation appears to be an adaptive response to hypoperfusion that may minimize the potential for further ischemia or necrosis. Revascularization of the hibernating (and/or stunned) myocardium generally leads to improved myocardial function. Consideration of the presence of myocardial stunning and hibernation is vital in patients with cardiogenic shock because of the therapeutic implications of these conditions. Hibernating myocardium improves with revascularization, whereas the stunned myocardium retains inotropic reserve and can respond to inotropic stimulation. To compensate for the diminished stroke volume, the curvilinear diastolic pressure-volume curve also shifts to the right, with a decrease in diastolic compliance. This leads to increased diastolic filling and increased LV end-diastolic pressure. The attempt to enhance cardiac output by this mechanism comes at the cost of having a higher LV diastolic filling pressure, which ultimately increases myocardial oxygen demand and can lead to pulmonary edema. As a result of decreased contractility, the patient develops elevated LV and RV filling pressures and low cardiac output. Mixed venous oxygen saturation falls because of the increased tissue oxygen extraction, which is due to the low cardiac output. This, combined with the intrapulmonary shunting that is often present, contributes to substantial arterial oxygen desaturation. When a critical mass of LV myocardium becomes ischemic and fails to pump effectively, stroke volume and cardiac output are curtailed. The LV pump function becomes depressed; cardiac output, stroke volume, and blood pressure decline while end-systolic volume increases. Myocardial ischemia is further exacerbated by impaired myocardial perfusion due to hypotension and tachycardia. The LV pump failure increases ventricular diastolic pressures concomitantly, causing additional wall stress and thereby elevating myocardial oxygen requirements. Systemic perfusion is compromised by decreased cardiac output, with tissue hypoperfusion intensifying anaerobic metabolism and instigating the formation of lactic acid (lactic acidosis), which further deteriorates the systolic performance of the myocardium. Depressed myocardial function also leads to the activation of several physiologic compensatory mechanisms. These include sympathetic stimulation, which increases the heart rate and cardiac contractility  and causes renal salt and fluid retention, hence augmenting the LV preload. The elevated heart rate and contractility increases myocardial oxygen demand, further worsening myocardial ischemia. Fluid retention and impaired LV diastolic filling triggered by tachycardia and ischemia worsen pulmonary venous congestion and hypoxemia. Sympathetically mediated vasoconstriction to maintain systemic blood pressure amplifies myocardial afterload, which additionally impairs cardiac performance. Usually, a combination of systolic and diastolic myocardial dysfunction is present in patients with cardiogenic shock. Metabolic derangements that impair myocardial contractility further compromise systolic ventricular function. Myocardial ischemia decreases myocardial compliance, thereby elevating LV filling pressure at a given end-diastolic volume (diastolic dysfunction), which leads to pulmonary congestion and congestive heart failure. Shock state, irrespective of the etiology, is described as a syndrome initiated by acute systemic hypoperfusion that leads to tissue hypoxia and vital organ dysfunction. All forms of shock are characterized by inadequate perfusion to meet the metabolic demands of the tissues. A maldistribution of blood flow to end organs begets cellular hypoxia and end organ damage, the well-described multisystem organ dysfunction syndrome. The organs of vital importance are the brain, heart, and kidneys. A decline in higher cortical function may indicate diminished perfusion of the brain, which leads to an altered mental status ranging from confusion and agitation to flaccid coma. The heart plays a central role in propagating shock. Depressed coronary perfusion leads to worsening cardiac dysfunction and a cycle of self-perpetuating progression of global hypoperfusion. Renal compensation for reduced perfusion results in diminished glomerular filtration, causing oliguria and subsequent renal failure. The vast majority of cases of cardiogenic shock in adults are due to acute myocardial ischemia. Indeed, cardiogenic shock is generally associated with the loss of more than 40% of the LV myocardium, although in patients with previously compromised LV function, even a small infarction may precipitate shock. Cardiogenic shock is more likely to develop in people who are elderly or diabetic or in persons who have had a previous inferior MI. Complications of acute MI, such as acute mitral regurgitation, large RV infarction, rupture of the interventricular septum or LV free wall, and tamponade can result in cardiogenic shock. Conduction abnormalities (eg, atrioventricular blocks, sinus bradycardia) are also risk factors. In children, preceding viral infection may cause myocarditis. In addition, children and infants may have unrecognized congenital structural heart defects that are well compensated until there is a stressor. These etiologies plus toxic ingestions make up the three primary causes of cardiogenic shock in children. A systemic inflammatory response syndrome–type mechanism has also been implicated in the etiology of cardiogenic shock. Elevated levels of white blood cells, body temperature, complement, interleukins, and C-reactive protein are often seen in large myocardial infarctions. Similarly, inflammatory nitric oxide synthetase (iNOS) is also released in high levels during myocardial stress. Nitric oxide production induced by iNOS may uncouple calcium metabolism in the myocardium resulting in a stunned myocardium. Additionally, iNOS leads to the expression of interleukins, which may themselves cause hypotension. Valvular dysfunction may immediately lead to cardiogenic shock, or it may aggravate other etiologies of shock. Acute mitral regurgitation secondary to papillary muscle rupture or dysfunction is caused by ischemic injury. Rarely, acute obstruction of the mitral valve by a left atrial thrombus may result in cardiogenic shock by means of severely decreased cardiac output. Aortic and mitral regurgitation reduce forward flow, raise end-diastolic pressure, and aggravate shock associated with other etiologies. Ventricular tachyarrhythmias are often associated with cardiogenic shock. Furthermore, bradyarrhythmias may cause or aggravate shock due to another etiology. Sinus tachycardia and atrial tachyarrhythmias contribute to hypoperfusion and aggravate shock. The incidence rate of cardiogenic shock ranges from 5% to 10% in patients with acute MI. In the Worcester Heart Attack Study, a community-wide analysis, the reported incidence rate was 7.5%. The literature contains few data on cardiogenic shock in patients without ischemia. Several multicenter thrombolytic trials in Europe reported a prevalence rate of cardiogenic shock following MI of approximately 7%. Median age for cardiogenic shock mirrors the bimodal distribution of disease. For adults, the median age ranges from 65-66 years. For children, cardiogenic shock presents as a consequence of fulminant myocarditis or congenital heart disease. Cardiogenic shock is the leading cause of death in acute MI. In the absence of aggressive, highly experienced technical care, mortality rates among patients with cardiogenic shock are exceedingly high (up to 70-90%). The key to achieving a good outcome is rapid diagnosis, prompt supportive therapy, and expeditious coronary artery revascularization in patients with myocardial ischemia and infarction. [12, 13, 14] Thus, with the implementation of prompt revascularization, improved interventional procedures, and better medical therapies and mechanical support devices, the mortality rates from cardiogenic shock may continue to decline. Evidence of RV dilatation on an echocardiogram may indicate a worse outcome in patients with cardiogenic shock, as may RV infarction on a right-side electrocardiogram. The prognosis for patients who survive cardiogenic shock is not well studied but may be favorable if the underlying cause of shock is expeditiously corrected. Echocardiographic findings such as LV ejection fraction (LVEF) and mitral regurgitation are independent predictors of mortality. An ejection fraction of less than 28% has been associated with a survival rate of 24% at 1 year, compared to a survival rate of 56% with a higher ejection fraction. Moderate or severe mitral regurgitation was found to be associated with a 1-year survival rate of 31%, compared to a survival rate of 58% in patients with no regurgitation. The time to reperfusion is an important predictor of mortality in acute MI complicated by cardiogenic shock. In patients with shock, the in-hospital mortality rate increased progressively with increasing time-to-reperfusion. Outcomes in cardiogenic shock significantly improve only when rapid revascularization can be achieved. The SHOCK (Should We Emergently Revascularize Occluded Coronaries for Cardiogenic Shock?) trial demonstrated that overall mortality when revascularization occurs is 38%. When rapid revascularization is not attempted, mortality rates approach 70%. Rates vary depending on the procedure (eg, percutaneous transluminal coronary angioplasty, stent placement, thrombolytic therapy). Alonso DR, Scheidt S, Post M, Killip T. Pathophysiology of cardiogenic shock. Quantification of myocardial necrosis, clinical, pathologic and electrocardiographic correlations. Circulation. 1973 Sep. 48 (3):588-96. [Medline]. Reynolds HR, Hochman JS. Cardiogenic shock: current concepts and improving outcomes. Circulation. 2008 Feb 5. 117(5):686-97. [Medline]. Funaro S, La Torre G, Madonna M, et al, for the AMICI Investigators. Incidence, determinants, and prognostic value of reverse left ventricular remodelling after primary percutaneous coronary intervention: results of the Acute Myocardial Infarction Contrast Imaging (AMICI) multicenter study. Eur Heart J. 2009 Mar. 30 (5):566-75. [Medline]. Forrester JS, Wyatt HL, Da Luz PL, Tyberg JV, Diamond GA, Swan HJ. Functional significance of regional ischemic contraction abnormalities. Circulation. 1976 Jul. 54 (1):64-70. [Medline]. Beyersdorf F, Buckberg GD, Acar C, et al. Cardiogenic shock after acute coronary occlusion. Pathogenesis, early diagnosis, and treatment. Thorac Cardiovasc Surg. 1989 Feb. 37 (1):28-36. [Medline]. Al-Reesi A, Al-Zadjali N, Perry J, et al. Do beta-blockers reduce short-term mortality following acute myocardial infarction? A systematic review and meta-analysis. CJEM. 2008 May. 10(3):215-23. [Medline]. Chen ZM, Pan HC, Chen YP, et al. Early intravenous then oral metoprolol in 45,852 patients with acute myocardial infarction: randomised placebo-controlled trial. Lancet. 2005 Nov 5. 366(9497):1622-32. [Medline]. Kolte D, Khera S, Aronow WS, et al. Trends in incidence, management, and outcomes of cardiogenic shock complicating ST-elevation myocardial infarction in the United States. J Am Heart Assoc. 2014 Jan 13. 3 (1):e000590. [Medline]. Goldberg RJ, Samad NA, Yarzebski J, Gurwitz J, Bigelow C, Gore JM. Temporal trends in cardiogenic shock complicating acute myocardial infarction. N Engl J Med. 1999 Apr 15. 340(15):1162-8. [Medline]. Graf T, Desch S, Eitel I, Thiele H. Acute myocardial infarction and cardiogenic shock: pharmacologic and mechanical hemodynamic support pathways. Coron Artery Dis. 2015 Sep. 26 (6):535-44. [Medline]. Babaev A, Frederick PD, Pasta DJ, Every N, Sichrovsky T, Hochman JS. Trends in management and outcomes of patients with acute myocardial infarction complicated by cardiogenic shock. JAMA. 2005 Jul 27. 294(4):448-54. [Medline]. Fox KA, Steg PG, Eagle KA, Goodman SG, Anderson FA Jr, Granger CB, et al. Decline in rates of death and heart failure in acute coronary syndromes, 1999-2006. JAMA. 2007 May 2. 297(17):1892-900. [Medline]. Jeger RV, Radovanovic D, Hunziker PR, Pfisterer ME, Stauffer JC, Erne P, et al. Ten-year trends in the incidence and treatment of cardiogenic shock. Ann Intern Med. 2008 Nov 4. 149(9):618-26. [Medline]. [Guideline] Amsterdam EA, Wenger NK, Brindis RG, et al, for the ACC, AHA Task Force on Practice Guidelines, et al. 2014 AHA/ACC guideline for the management of patients with non-ST-elevation acute coronary syndromes: a report of the American College of Cardiology/American Heart Association Task Force on Practice Guidelines. J Am Coll Cardiol. 2014 Dec 23. 64 (24):e139-228. [Medline]. [Full Text]. Kunadian V, Qiu W, Ludman P, et al, for the National Institute for Cardiovascular Outcomes Research. Outcomes in patients with cardiogenic shock following percutaneous coronary intervention in the contemporary era: an analysis from the BCIS database (British Cardiovascular Intervention Society). JACC Cardiovasc Interv. 2014 Dec. 7 (12):1374-85. [Medline]. Hamon M, Agostini D, Le Page O, Riddell JW, Hamon M. Prognostic impact of right ventricular involvement in patients with acute myocardial infarction: meta-analysis. Crit Care Med. 2008 Jul. 36(7):2023-33. [Medline]. Hasdai D, Califf RM, Thompson TD, Hochman JS, Ohman EM, Pfisterer M, et al. Predictors of cardiogenic shock after thrombolytic therapy for acute myocardial infarction. J Am Coll Cardiol. 2000 Jan. 35(1):136-43. [Medline]. Picard MH, Davidoff R, Sleeper LA, and the SHOCK Trial investigators. SHould we emergently revascularize Occluded Coronaries for cardiogenic shocK. Echocardiographic predictors of survival and response to early revascularization in cardiogenic shock. Circulation. 2003 Jan 21. 107 (2):279-84. [Medline]. Jeger RV, Lowe AM, Buller CE, Pfisterer ME, Dzavik V, Webb JG, et al. Hemodynamic parameters are prognostically important in cardiogenic shock but similar following early revascularization or initial medical stabilization: a report from the SHOCK Trial. Chest. 2007 Dec. 132(6):1794-803. [Medline]. Hochman JS, Sleeper LA, White HD, Dzavik V, Wong SC, Menon V, et al. One-year survival following early revascularization for cardiogenic shock. JAMA. 2001 Jan 10. 285(2):190-2. [Medline]. Shin TG, Choi JH, Jo IJ, Sim MS, Song HG, Jeong YK, et al. Extracorporeal cardiopulmonary resuscitation in patients with inhospital cardiac arrest: A comparison with conventional cardiopulmonary resuscitation. Crit Care Med. 2011 Jan. 39(1):1-7. [Medline]. De Backer D, Biston P, Devriendt J, et al, for the SOAP II Investigators. Comparison of dopamine and norepinephrine in the treatment of shock. N Engl J Med. 2010 Mar 4. 362 (9):779-89. [Medline]. Ellender TJ, Skinner JC. The use of vasopressors and inotropes in the emergency medical treatment of shock. Emerg Med Clin North Am. 2008 Aug. 26(3):759-86, ix. [Medline]. Naples RM, Harris JW, Ghaemmaghami CA. Critical care aspects in the management of patients with acute coronary syndromes. Emerg Med Clin North Am. 2008 Aug. 26(3):685-702, viii. [Medline]. Felker GM, Benza RL, Chandler AB, et al, for the OPTIME-CHF Investigators. Heart failure etiology and response to milrinone in decompensated heart failure: results from the OPTIME-CHF study. J Am Coll Cardiol. 2003 Mar 19. 41 (6):997-1003. [Medline]. Gheorghiade M, Gattis WA, Klein L. OPTIME in CHF trial: rethinking the use of inotropes in the management of worsening chronic heart failure resulting in hospitalization. Eur J Heart Fail. 2003 Jan. 5 (1):9-12. [Medline]. Fuhrmann JT, Schmeisser A, Schulze MR, Wunderlich C, Schoen SP, Rauwolf T, et al. Levosimendan is superior to enoximone in refractory cardiogenic shock complicating acute myocardial infarction. Crit Care Med. 2008 Aug. 36(8):2257-66. [Medline]. De Luca L, Colucci WS, Nieminen MS, Massie BM, Gheorghiade M. Evidence-based use of levosimendan in different clinical settings. Eur Heart J. 2006 Aug. 27(16):1908-20. [Medline]. Gruppo Italiano per lo Studio della Streptochinasi nell'Infarto Miocardico (GISSI). Effectiveness of intravenous thrombolytic treatment in acute myocardial infarction. Lancet. 1986 Feb 22. 1 (8478):397-402. [Medline]. Gruppo Italiano per lo Studio della Streptochi-nasi nell'Infarto Miocardico (GISSI). Long-term effects of intravenous thrombolysis in acute myocardial infarction: final report of the GISSI study. Lancet. 1987 Oct 17. 2 (8564):871-4. [Medline]. Sanborn TA, Sleeper LA, Bates ER, et al. Impact of thrombolysis, intra-aortic balloon pump counterpulsation, and their combination in cardiogenic shock complicating acute myocardial infarction: a report from the SHOCK Trial Registry. SHould we emergently revascularize Occluded Coronaries for cardiogenic shocK?. J Am Coll Cardiol. 2000 Sep. 36(3 Suppl A):1123-9. [Medline]. Garatti A, Russo C, Lanfranconi M, Colombo T, Bruschi G, Trunfio S, et al. Mechanical circulatory support for cardiogenic shock complicating acute myocardial infarction: an experimental and clinical review. ASAIO J. 2007 May-Jun. 53(3):278-87. [Medline]. Cheng JM, den Uil CA, Hoeks SE, van der Ent M, Jewbali LS, van Domburg RT, et al. Percutaneous left ventricular assist devices vs. intra-aortic balloon pump counterpulsation for treatment of cardiogenic shock: a meta-analysis of controlled trials. Eur Heart J. 2009 Sep. 30(17):2102-8. [Medline]. Sjauw KD, Engstrom AE, Vis MM, et al. A systematic review and meta-analysis of intra-aortic balloon pump therapy in ST-elevation myocardial infarction: should we change the guidelines?. Eur Heart J. 2009 Feb. 30 (4):459-68. [Medline]. Ramanathan K, Farkouh ME, Cosmi JE, French JK, Harkness SM, Džavík V, et al. Rapid complete reversal of systemic hypoperfusion after intra-aortic balloon pump counterpulsation and survival in cardiogenic shock complicating an acute myocardial infarction. Am Heart J. 2011 Aug. 162(2):268-75. [Medline]. [Full Text]. Thiele H, Zeymer U, Neumann FJ, et al. Intraaortic balloon support for myocardial infarction with cardiogenic shock. N Engl J Med. 2012 Oct 4. 367(14):1287-96. [Medline]. Windecker S. Percutaneous left ventricular assist devices for treatment of patients with cardiogenic shock. Curr Opin Crit Care. 2007 Oct. 13(5):521-7. [Medline]. Rose EA, Gelijns AC, Moskowitz AJ, Heitjan DF, Stevenson LW, Dembitsky W, et al. Long-term use of a left ventricular assist device for end-stage heart failure. N Engl J Med. 2001 Nov 15. 345(20):1435-43. [Medline]. Farrar DJ, Lawson JH, Litwak P, Cederwall G. Thoratec VAD system as a bridge to heart transplantation. J Heart Transplant. 1990 Jul-Aug. 9(4):415-22; discussion 422-3. [Medline]. Damme L, Heatley J, Radovancevic B. Clinical results with the HeartMate LVAD: Worldwide Registry update. J Congestive Heart Failure Circ Support. 2001. 2:5-7(3). Hochman JS, Sleeper LA, Webb JG, Sanborn TA, White HD, Talley JD, et al. Early revascularization in acute myocardial infarction complicated by cardiogenic shock. SHOCK Investigators. Should We Emergently Revascularize Occluded Coronaries for Cardiogenic Shock. N Engl J Med. 1999 Aug 26. 341(9):625-34. [Medline]. Antoniucci D, Valenti R, Migliorini A, Moschi G, Trapani M, Buonamici P, et al. Relation of time to treatment and mortality in patients with acute myocardial infarction undergoing primary coronary angioplasty. Am J Cardiol. 2002 Jun 1. 89(11):1248-52. [Medline]. Hochman JS, Boland J, Sleeper LA, Porway M, Brinker J, Col J, et al. Current spectrum of cardiogenic shock and effect of early revascularization on mortality. Results of an International Registry. SHOCK Registry Investigators. Circulation. 1995 Feb 1. 91(3):873-81. [Medline]. Jeger RV, Harkness SM, Ramanathan K, et al, for the SHOCK Investigators. Emergency revascularization in patients with cardiogenic shock on admission: a report from the SHOCK trial and registry. Eur Heart J. 2006 Mar. 27 (6):664-70. [Medline]. Hochman JS, Sleeper LA, Webb JG, et al, for the SHOCK Investigators. Early revascularization and long-term survival in cardiogenic shock complicating acute myocardial infarction. JAMA. 2006 Jun 7. 295 (21):2511-5. [Medline]. [Guideline] Ponikowski P, Voors AA, Anker SD, et al, Authors/Task Force Members. 2016 ESC Guidelines for the diagnosis and treatment of acute and chronic heart failure: The Task Force for the diagnosis and treatment of acute and chronic heart failure of the European Society of Cardiology (ESC)Developed with the special contribution of the Heart Failure Association (HFA) of the ESC. Eur Heart J. 2016 Jul 14. 37 (27):2129-200. [Medline]. [Full Text]. [Guideline] Rihal CS, Naidu SS, Givertz MM, et al. 2015 SCAI/ACC/HFSA/STS Clinical Expert Consensus Statement on the Use of Percutaneous Mechanical Circulatory Support Devices in Cardiovascular Care: Endorsed by the American Heart Assocation, the Cardiological Society of India, and Sociedad Latino Americana de Cardiologia Intervencion; Affirmation of Value by the Canadian Association of Interventional Cardiology-Association Canadienne de Cardiologie d'intervention. J Am Coll Cardiol. 2015 May 19. 65 (19):e7-e26. [Medline]. [Full Text]. [Guideline] Feldman D, Pamboukian SV, Teuteberg JJ, et al. The 2013 International Society for Heart and Lung Transplantation Guidelines for mechanical circulatory support: executive summary. J Heart Lung Transplant. 2013 Feb. 32 (2):157-87. [Medline]. [Full Text]. Slottosch I, Liakopoulos O, Kuhn E, Deppe AC, Scherner M, Madershahian N, et al. Outcomes after peripheral extracorporeal membrane oxygenation therapy for postcardiotomy cardiogenic shock: a single-center experience. J Surg Res. 2013 May. 181 (2):e47-55. [Medline]. Anderson ML, Peterson ED, Peng SA, et al. Differences in the profile, treatment, and prognosis of patients with cardiogenic shock by myocardial infarction classification: A report from NCDR. Circ Cardiovasc Qual Outcomes. 2013 Nov. 6 (6):708-15. [Medline]. Menon V, White H, LeJemtel T, et al. The clinical profile of patients with suspected cardiogenic shock due to predominant left ventricular failure: a report from the SHOCK Trial Registry. SHould we emergently revascularize Occluded Coronaries in cardiogenic shocK?. J Am Coll Cardiol. 2000 Sep. 36 (3 suppl A):1071-6. [Medline]. Koprivanac M, Kelava M, Soltesz E, et al. Advances in temporary mechanical support for treatment of cardiogenic shock. Expert Rev Med Devices. 2015 Nov. 12 (6):689-702. [Medline]. Susen S, Rauch A, Van Belle E, Vincentelli A, Lenting PJ. Circulatory support devices: fundamental aspects and clinical management of bleeding and thrombosis. J Thromb Haemost. 2015 Oct. 13 (10):1757-67. [Medline]. 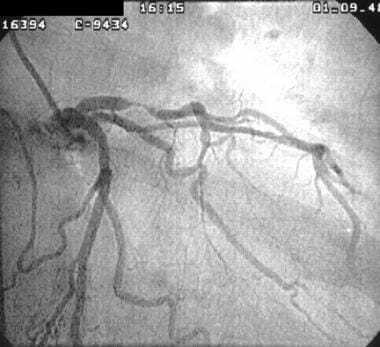 A coronary angiogram image of a patient with cardiogenic shock demonstrates severe stenosis of the left anterior descending coronary artery. A coronary angiogram image of a patient with cardiogenic shock demonstrates severe stenosis of the left anterior descending coronary artery. Following angioplasty of the critical stenosis, coronary flow is reestablished. The patient recovered from cardiogenic shock. This ECG shows evidence of an extensive anterolateral myocardial infarction; this patient subsequently developed cardiogenic shock. ECG tracing shows further evolutionary changes in a patient with cardiogenic shock. ECG tracing in a patient who developed cardiogenic shock secondary to pericarditis and pericardial tamponade. A 63-year-old man admitted to the emergency department with clinical features of cardiogenic shock. The ECG revealed findings indicative of wide-complex tachycardia, likely ventricular tachycardia. Following cardioversion, his shock state improved. The cause of ventricular tachycardia was myocardial ischemia. Short-axis view of the left ventricle demonstrating small pericardial effusion, low ejection fraction, and segmental wall motion abnormalities. Courtesy of Michael Stone, MD, RDMS. Pleural sliding in an intercostal space demonstrating increased lung comet artifacts suggestive of pulmonary edema. Courtesy of Michael Stone, MD, RDMS. HeartMate II Left Ventricular Assist Device. Reprinted with the permission of Thoratec Corporation.